Having a sturdy, healthy relationship with anyone can be a beneficial thing to have when you have anxiety. Having that one person that is there… that can help you.. that can pull you out of that dark place can be amazing. When I say relationship… I don’t mean just a relationship with a significant other… Relationships could mean your mom…you brother/sister or even your best friend. It is vitally important for someone suffering anxiety or depression to have that one person that never judges….and always understands. I sometimes like to scroll thru Pinterest just to pass the time. There are things that others have posted from Tumblr or other sites. That is when I found the picture from above. And I thought… hey this I can write about and just possibly explain why these are important. 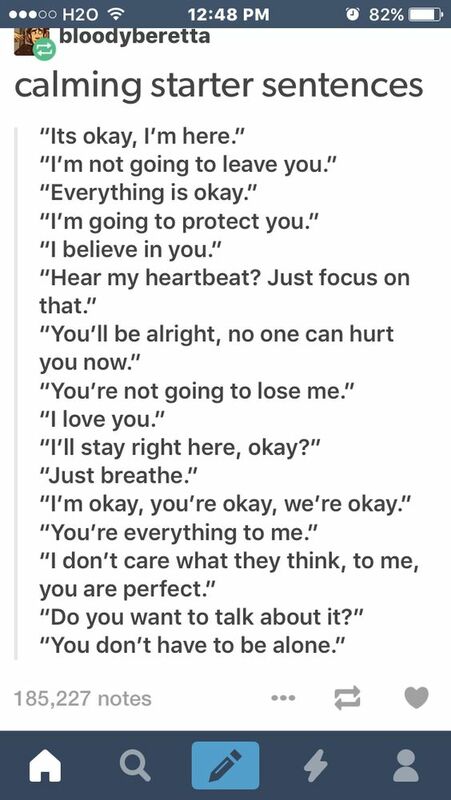 This way if you have someone in your life that suffers from anxiety.. you can learn a few comforting words that might help. Alright. Here we go…. Knowing that someone is there for you is very important. With anxiety…it can sometimes feel like we’re all alone in this world. Having that one person that is there for you and never judges and is willing to try to help you pull out of that dark place is very important. This should always be the go to phrase when someone you love is having one of those days. Ah yes. With anxiety we sometimes feel alone. Or at least I do. I have quoted the line from One Tree Hill all the time…. 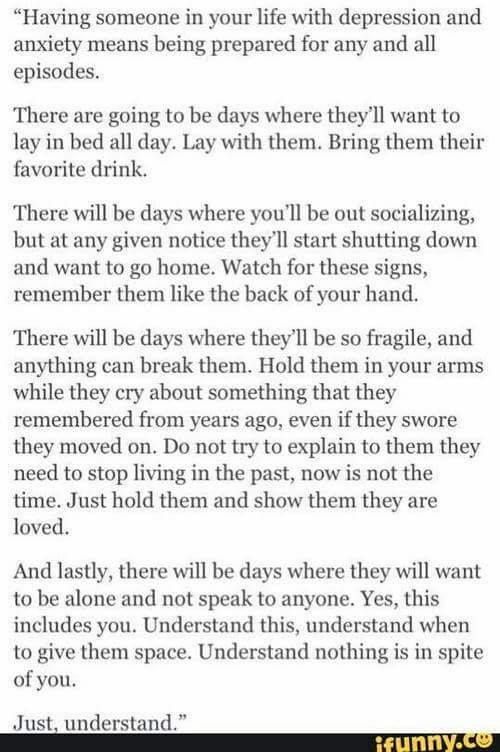 ‘people always leave’ Therefore, when someone like my husband sticks it out and puts up with all my anxious crap and continues to tell me that he will not leave. it is a little reassuring. and allows me to center myself. Yeah.. this one phrase is not my favorite. To me, saying everything is ok is like telling me its all in my head. Because at that moment…everything is not ok.. This might work for your anxiety…but it doesn’t work for mine. That is sweet. As someone who suffers from anxiety.. I think it is sweet that someone is willing to protect me from my demons even if I am the only one who battles my demons. But anxiety is so draining. When you go thru an anxiety attack it is as if you have ran a marathon. It is tiring. All I want to do is sleep but I can’t. This is something that can help someone be pulled out of an attack. This isn’t a technique that I have thought of trying. However, I just might have too. I know that there is more to that quote. However, the first part kind of makes me upset. I know that it shouldn’t. I know that they’re just trying to help. But it is kind of like being told hey cry baby you’ll be alright. I find this one to be very significant. Know that the person who understands you. who never judges you. who is always there for you isn’t going to leave. That is an amazing feeling. There are many more of these amazing ways to help someone with anxiety. If you have someone in your life who suffers from anxiety…take a look at these sayings. Maybe these can help you help your loved one.